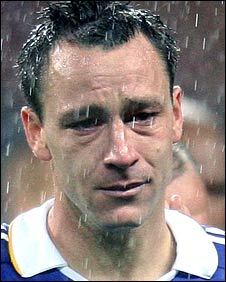 Chelsea's John Terry says his penalty miss in the Champions League final will haunt him for the rest of his life. "I am so sorry for missing the penalty and denying the fans, my team-mates, family and friends the chance to be European champions," he said. "I have relived that moment every minute since it happened. "I walked forward to take it knowing that it was there to be won and it was all down to me. What happened next will haunt me for the rest of my life." Chelsea went into a penalty shoot-out against Manchester United after the match ended 1-1 following extra time in Moscow. Skipper Terry stepped up to take Chelsea's fifth penalty with the scores level at 4-4 but he slipped as he shot and the ball clipped the outside of the post. Manchester United went on to win the shoot-out 6-5 and lift the European Cup. "I have only slept a few hours and wake up every time hoping it's all been a bad dream," added Terry. "I have watched it again on TV. You can see I slipped and I still can't believe it." Terry, who sobbed uncontrollably after Chelsea's defeat, added: "I feel I have let everybody down and this hurts me more than anything. "I am not ashamed about crying. This is a trophy I have tried so hard to win year after year and it was just an uncontrollable reaction. I wear my heart on my sleeve and everyone knows that." Chelsea sacked manager Avram Grant three days after the defeat by Manchester United, which followed runners-up finishes in the Premier League and Carling Cup.